A good natural port. I strongly recommend you to visit wonderful Ine. Check the blue line on my Google map. When you approach Ine Port from the north, even after passing by the promontory, you keep sailing down to the south until you don’t see fishing nets on your right. Once you confirm open waters without fishing nets, you head to between Ao-shima Island and the red lighthouse, seeing fishing nets on your right. The fishing nets were spread amazingly away; and its area was bigger than showed on a Japanese pilot book. Passing by Ao-shima Island and the red lighthouse on your each side, you head to the north. 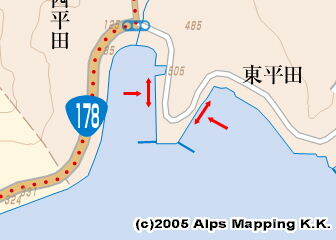 Then you will see a small breakwater, inside which there is a cove for good berth places. When I approached there, there was a boat of Ine Town Fire Dept moored in the cove. The back of the cove was widely open other than two fishing boats moored bow-to. I moored my boat bow-to heading to the east near the small breakwater. But tomorrow morning, a woman who was charging anglers fishing fees told me to move my boat to the back of the two fishing boats. My boat seemed to stand in the way of her charged anglers fishing. “Yachts are always moored in order from the innermost.” she said. I moved to the back of the fishing boats and moored in the middle of an open quay. At the end of the quay, there was a marine taxi loading passengers. I was also told that another good berth was at the innermost of the quay in the north of a rusting pontoon. I thought there would be some stern waves of starting fishing boats in the morning. No fishing boat was starting in the morning at the berth where I moored. The rusting pontoon was closed with an off-limits sign and steel fences. No public bathhouse. No coin laundry. There is a toilet in front of your berth. But, I put my horse there and filled two hand-carry tanks with water. It would be OK, I thought. Provisions: There are only a couple of small shops. But, as goods are not enough, you shouldn’t plan provisions here. Fuel service was not confirmed. Notes: Sake brewery “Mukai Shuzo” in 5 minutes walk away is well worth a visit. The brewary has a good shop with atmosphere. An autograph book was there, on which I saw yachties signatures. 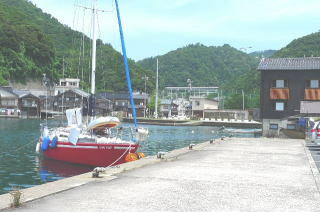 Ine Port has famous historical over 200 wooden boat houses which second floor is the residence.